I fly kites nearly as long as my brother Christian. 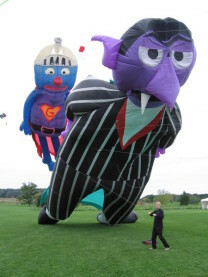 In fact, he taught me (more or less) to fly kites. But that was in the 80’s… Lets jump to the 90’s: Starting with stuntkites, I soon started to make my first single line kites. One of the early ones was a delta, made with alu tubes and a shower curtain. It lasted several years and except of the several repaintings of the Ernie and Bert graphics, it was nearly indestructible. It must have been from `93 until `96 that I started to spend my time with buggying and together with the other No Limits. The buggy time was followed (and partly overlapped) for 2 years with mainly single line kites. Those single line kites had sticks. Nowadays it seems a bit strange that I had Box kites, a 1,8m!!! Rokakku and also a 3,5m Snowflake box kite. 3 Genki kites (only one sucessful), a "De La Porta" and a 3m Powersled with a Quiz graphic spend quite a time in the air. Then there was the idea to make Sesame Street characters. Supergroover was mine. I asked my classmates in school to borrow me comics of Supergroover to have at least something to base on. Puppets of that character were quite unavailable that time. Then I finished school and after my social year, I decided to make an apprenticeship. My decision to make an apprentiship as a sailmaker was based on my hobby: Flying and making kites. I managed to have a rather good graduation, although I was not really a sailing person. I simply liked the job. After my apprenticeship, I went for 6 months to New Zealand, were I spent my time mainly at Peter Lynn Kites. The following 5 years, I spent in Lübeck at the Baltic Sea at an university of applied sciences.. There I got my engineering degree. My time as a student was for one year spiced up with an internship in Nanjing/ China. Between my graduation and my current lob, I spent again a few weeks in New Zealand. It was again PLK who pursuaded me to go there. It was not a big argument, it was february and summer in NZ, a family celebration at the Lynns,… well, and there was the winter in Germany which made it an easy decision to meet the Kiwis. 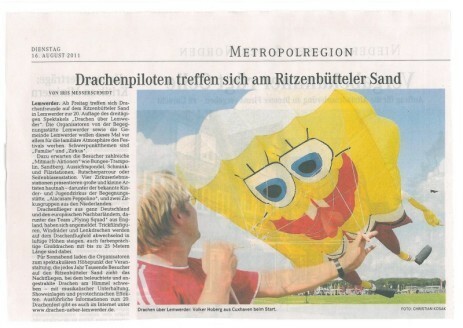 And there was an interesting job to do: Make a powerful kite to lift sth. heavy. A box of limonade is considered to be heavy by some… Kitebags, ready to travel are heavy for others. There are bicycles lifted into the air, and Mr. S.F. Cody lifted himself into the air, as same as Mr. L. Hargrave. But a Landrover 4*4 is another level of being heavy. And the Kite I made in cooperation with PLK should simply lift one of those. And I am sure it can. Later, I lived and worked in Strasbourg in the the beautiful Alsace region in France. It is a bit far from the sea, and „good wind“ is really rare. The same is true for my current domicile in Karlsruhe, in the south-west of Germany. 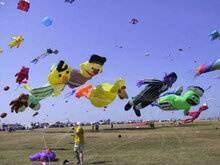 A judgement of the average wind here: Christian quoted years ago: There are no bad conditions for kiteflying! The kites are just not good enough to work in those conditions.